​Sunset Logistics is a Michigan-based carrier providing nationwide service. We set ourselves apart from other freight transport companies by being large enough to handle your freight to and from every state, yet small enough that your freight is important to us. At Sunset Logistics, we take pride in providing excellent service to you. We deliver your freight safely and on time. We believe this is what sets our company apart, making us the obvious choice among freight transport companies. Sunset Logistics is an asset based carrier. What does that mean to you? We have a fleet of van trailers at your disposal. This gives us the ability to service all of your needs, whether it is drop trailers to meet your capacity needs or live load service. Our asset base of drivers, tractors, and trailers gives you the versatility to meet your needs so that you can better serve your customer base. Sunset Logistics loads from anywhere to everywhere, we’ll get it there. Count on Sunset Logistics to provide multiple solutions with your freight. We offer: Dry Vans, Drop Frame Trailers, Spotted Trailers, Load Bars, Pads, Straps, and so much more! 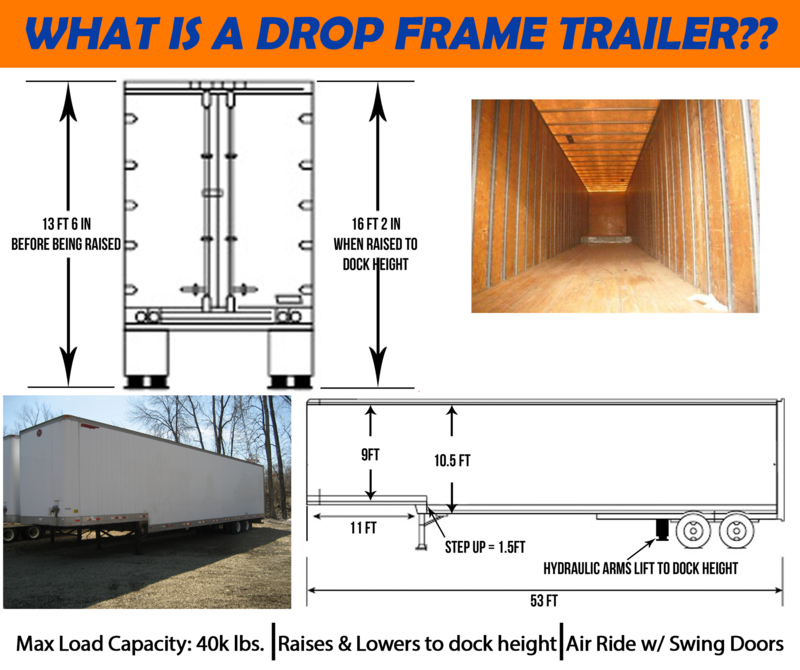 What is a Drop Frame Trailer? From office furniture to many different food grade products, there are very few products that we can’t handle. Our trailers have clean interiors and are equipped with logistics posts for securing cargo. All dry van trailers are equipped with aerodynamic devices and low rolling resistance tires and are fully compliant with all CARB regulations. Trailers are serviced regularly to ensure equipment is in optimum mechanical condition so your freight delivers on time without unnecessary complication. We offer drop trailers at both shippers and consignees for customer convenience. Sunset Logistics offers team service to deliver your time-sensitive freight quickly. We can provide team service on both dry van and refrigerated freight. This feature, along with our experienced team driver’s outstanding safety records, will put your mind at ease. All of our drivers are trained in maintaining security and are vigilant at all times. Our equipment is comprised of late-model tractors and trailers which provide reliable service. In the unlikely event that a breakdown does occur, our drivers can alert our operations team 24/7 so that we can begin to formulate a plan to secure your freight and deliver it on time. We will call you immediately if we think there may be a delay and provide a realistic solution for you. We are installing Qualcomm MCP50 mobile communications and tracking devices in our fleet. We also send dispatch load information and other messages to our driver via this system. This reduces the opportunity for error or mis-communication of load requirements to the driver. GPS technology allows us to pinpoint the location of your load within minutes. Sunset Logistics offers dedicated solutions for your needs. Regardless if you have concerns with time constraints, weight restrictions, or the need for a flexible back haul; Sunset Logistics can create a solution for your dedicated freight. We are a nationwide carrier based in the Midwest and cover all 48 states. We ship coast to coast and border to border. Our average length of haul is more than 750 miles. We do not service Canada or Mexico markets. We can easily get your freight to or from anywhere in the United States! Our goal is to deliver your freight safely and on time. Knowledgeable staff that are prepared to solve your problems, not cause them. Hiring only the safest, best qualified drivers. Operating well maintained, late model, fuel efficient trucks.